Notes: Based on the series by "father of Japanese animation," Tezuka Osamu, this series ended at episode 61 and picked up in the Spring 2006 season with the series Black Jack 21. Tezuka Osamu presents the quintessential antihero in the character Kazama Kuro. The young, charismatic but sinister prodigy whose god-like medical skills are spoken in careful whispers throughout the hospital hallways. Under the pseudonym Black Jack, the rogue doctor performs incredible, even impossible, procedures, vowing to defy science, ethics, and even fate for the sake of life--the very life that was tragically ripped from his mother during his early childhood. Equally as famous as his medical skills are his outrageous service fees. No one knows what the doctor does with the money he receives--he lives modestly with his assistant and companion Pinoco (the "eighteen-year-old elementary-schooler" who smitteningly insists she is her doctor's wife, regardless of her childlike appearance) just off the Yamanote and Seibu Shinjuku lines near Takadanobaba (*fangirls* where I live!!!). But the fees certainly scare off the frivolous. 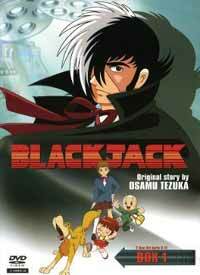 Black Jack only operates on those who truly understand the true value of life. Though the tone of the television series is still quite serious, Black Jack TV is drastically lighter in tone than its grittier releases from the mid-90s that American fans are more familiar with. Some might consider that a drawback--whereas I do not. The Black Jack TV series is able to reach a wider audience--still maintaining the soul and depth of our hero, without subjecting the audience to the sometimes shockingly graphic medical procedures that would never back in American or Japanese prime time. Having worked as my father's assistant in his veterinary practice, intestinal fortitude has never been an issue of mine. But the Black Jack movies and OVAs quite successfully portrayed the horror that can befall a human body (and just seeing clips of it made me pale). The television series chose to focus on a different aspect in the battle called life--and that is the horror that can befall society that doesn't appreciate the value of even the smallest life. Rather than a medical psycho-thriller, Black Jack TV presents us with a progressive and timely social commentary (really deeming BJ a classic character, considering he was conceived in 1973) based loyally on Tezuka's original manga. Contrasted against Black Jack's lone, brooding presence is a supporting cast who, outside of Pinoco, had a much smaller presence or were completely absent from the storyline prior to this series. Pinoco and Largo, the sixth-sense dog thief, have nearly equal (though not quite!) airtime to the Doc--but fortunately they never over-stay their welcome or ruin any serious or touching scenes. Normally a viewer should be annoyed by the loud, bossy, and pushy little girl (Chibiusa, anyone? ), but Doc loves her, and so do we (especially if you know her backstory). Other regulars include other Tezuka regulars, namely Sharaku--the soft-spoken boy with a strange bandage on his forehead he refuses to remove (he is actually one of Tezuka's most beloved characters from the Three-Eyed One manga, which was his second most popular boy's manga after Astro Boy--the bandage is actually covering a third eye--but there is no sign if this is true in this series' canon), his tomboyish partner Wako, the Master of Tom Coffeeshop Tetsu, and the daughter of the late Dr. Honma Jotaro, who pieced the young Kuro together after the explosion. But this is okay--really, I don't think I could handle thirty minutes of dark brooding every week (especially since I am following NANA currently). Maybe some of you can, but I like to be moved and entertained at the same time. I like feeling good about things after watching them. 3: a larger supporting cast of reoccuring characters. ...it doesn't take away from what is a quality, long-running television series. I think I have a new favorite series--and yes--an anime lust object. I have returned to the fandom full-force! Recommended Audience: Recommended for anyone who wants thought-provoking, but not angst-inducing, drama. Teens and up for dark overtones, unapologetic handling of life-and-death situations, but really nothing above your usual ER fare.